Primary care providers include primary care physicians, physician assistants, and nurse practitioners. Primary care physicians are those in family and general practice, internal medicine, geriatrics, and pediatrics. Physician assistants are state-licensed health professionals practicing medicine under a physician’s supervision. Nurse practitioners are registered nurses with advanced clinical training. The ability to obtain primary care depends on the availability of primary care providers. A new NCHS report presents state estimates of the supply of primary care physicians per capita, as well as the availability of physician assistants or nurse practitioners in primary care physicians’ practices. Estimates are based on data from the National Ambulatory Medical Care Survey, Electronic Health Records Survey, a nationally representative survey of office-based physicians. In 2012, 46.1 primary care physicians and 65.5 specialists were available per 100,000 population. 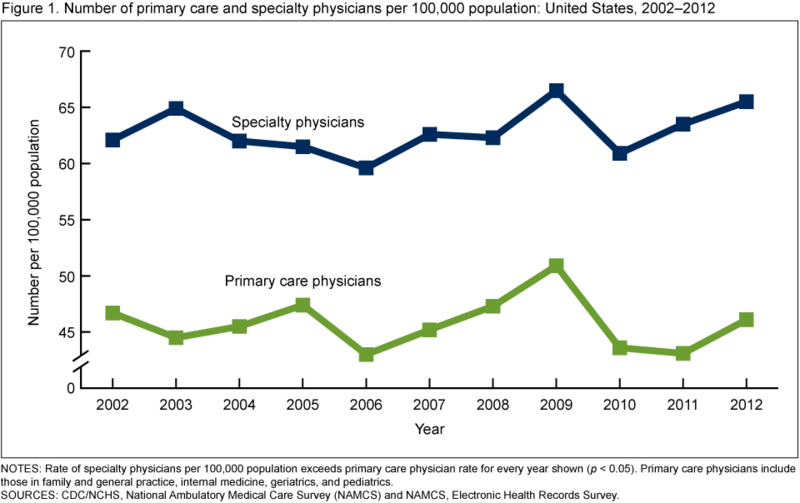 From 2002 through 2012, the supply of specialists consistently exceeded the supply of primary care physicians. Compared with the national average, the supply of primary care physicians was higher in Massachusetts, Rhode Island, Vermont, and Washington; it was lower in Arkansas, Georgia, Mississippi, Nevada, New Mexico, and Texas. In 2012, 53.0% of office-based primary care physicians worked with physician assistants or nurse practitioners. Compared with the national average, the percentage of physicians working with physician assistants or nurse practitioners was higher in 19 states and lower in Georgia. This entry was posted on Thursday, May 8th, 2014 at 10:42 am and is filed under Uncategorized. You can follow any responses to this entry through the RSS 2.0 feed. You can leave a response, or trackback from your own site.